The research I've done tells me that this probably is more of a breakfast/brunch thing but I had it for dinner. I'm such a rebel. Quite a lot of the recipes and menus I could find it in pairs Red Eye Gravy with grits. Scrambled eggs was my pairing, mostly due to the fact that I didn't have any grits at home. For those of you who wonders if I liked it or not, yes I did. I had a taste straight out of the frying pan and thought that this was a mistake. Backing down was never an option though so I spooned some of the Red Eye Gravy over the gammon steaks and sat down to eat. Now it worked, and it worked really well. It probably needed some of that smoked gammon as well as eggs to taste good. Next time you want to freak out your breakfast guests, serve them some coffee sauce. Oh yeah, if you wonder - that's not Red Eye Gravy on the scrambled eggs. That's hot-sauce. Fry the gammon pieces in a frying pan for about 4 - 5 minutes, turning half way. Remove and keep warm. Pour the coffee into the frying pan and let it boil for 2 - 3 minutes. While it's boiling, use a wooden spoon to deglaze the pan. 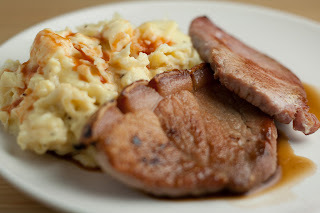 Plate the gammon and the scrambled eggs and spoon some of the red eye gravy on top. I wonder if red eye gravy was named so because you either ate it way late at night after a nightshift, or much too early in the morning before heading out to work. Either way, your's looks great. Hi, I saw your blog in Olive Magazine this month. Great photos! I think either of those could be the real reason. I can just see some miners or steelworkers sit in a classic diner eating this on their way to or from work. Hi, glad to hear that you found your way here and many thanks for the kind words. Hopefully you'll be back to find more stuff you like in future.